During the weekend of Nov. 18, there is a chance that a brief surge of meteors may be observed from Western Europe and Eastern North America. The famous Leonid meteors may come alive and produce a bevy of dozens of meteors within less than an hour's time [Story]. But forty years ago this week, one of the most stupendous Leonid meteor displays ever witnessed took place over western North America. The Leonids are a meteor stream where the Earth crosses through a dense clustering of particles at roughly 33-year intervals, sometimes causing shooting stars to rain down from the sky in a meteor storm. The comet responsible for shedding the Leonid debris is designated as 55P/Tempel-Tuttle. Over hundreds and thousands of years, a "river of rubble" has formed a closed loop around the orbit, far ahead and behind the comet. This enables us to observe at least some low-level activity (only around 10 meteors per hour) on an annual basis. But in those years immediately preceding or following the passage of comet Tempel-Tuttle through the inner solar system, our Earth stands a chance of encountering the densest part of the meteor swarm and the potential then exists for very high meteor activity. And 1966 was one of those years [image]. The grand display was anticipated for sometime during the morning hours of Nov. 17. However, unlike a solar or lunar eclipse where the exact timing and location are known precisely far in advance, forecasting a meteor shower back then was extremely uncertain. Today, meteor scientists can utilize high-speed computer simulations to precisely predict when our Earth will interact with dense trails of comet dust. But such technology did not exist 40 years ago. About the best that any astronomer could do was to make an educated guess. Interestingly, almost a full century had passed since comet Tempel-Tuttle was last seen. In 1965, German astronomer Joachim Schubart recalculated the comet's orbit, allowing astronomers to locate the lost comet. Until then, the consensus was that Tempel-Tuttle had disintegrated, and without its continuing supply of dust particles, the Leonids would ultimately fade away. But the comet's recovery proved that it was indeed still intact and still providing debris for future meteor showers each time it swept past the Sun. Also in November 1965, observers in Hawaii and Australia were treated to an unexpected surge of Leonid activity, with brilliant meteors darting across the sky at one or two per minute. "It now seems certain that the main part of the Leonid orbit has been removed from the Earth's orbit by successive perturbations from Jupiter and Saturn. So the recurrence of the tremendous meteoric storms of the Leonids seems unlikely." Another meteor expert, Donald W.R. McKinley agreed, stating flatly that "It is highly improbable that we shall ever again witness the full fury of the Leonid storm." Yet, despite these opinions, others had high hopes for the 1966 Leonids. The most sanguine prediction came from Dr. Kenneth L. Franklin, Chief Astronomer at New York's Hayden Planetarium. Dr. Franklin had carefully examined the orbit of Comet Tempel-Tuttle and came to the conclusion that " . . . the position of the comet is roughly what it was in 1833. So a dramatic shower like the one that occurred in that year may yet be in the offing for 1966." Based on Dr. Franklin's prediction, a "meteor party" was planned for the peak night of the Leonids in Central Park. New Yorkers of all ages were invited to gather on the Great Lawn at midnight to watch for the shooting stars. I remember that night very well. I was living in the Bronx and planned to be outside in my backyard from midnight through dawn to watch for the Leonids. After coming home from school in the afternoon, I made sure to do all my homework, have an early dinner and then, before getting a few hours of sleep, watched the local TV weathercasters, all of whom were promising no worse than "partly cloudy" weather for prospective sky watchers. When my alarm clock rang at the stroke of midnight, I bundled up and, with my grandfather in tow, anxiously ran outside to watch the celestial pyrotechnics display. Instead, to my chagrin, the sky was hopelessly cloudy! Forty years have passed, yet I can still clearly remember that bitter moment and just how crushed I was. After a few minutes, I sobbed to my grandfather, "But they promised it was only going to be partly cloudy tonight." To which he sadly replied, "I guess the partly is over." At Central Park, an estimated 10,000 people were looking at the same cloud cover. At least Dr. Franklin had the foresight to be above the clouds in an aircraft, just as he was the previous year when he successfully observed a spectacular comet (/1692-40-years-great-comet.html). He planned to report on the Leonids to a New York radio audience. But as the hours passed, it appeared that even from the plane, the Leonids were not very active. Finally, around 4 a.m., Dr. Franklin announced that his plane was returning to La Guardia Airport and that he was calling it a night. Beginning around 5 a.m. Eastern Time, Leonid activity suddenly began ramping up. 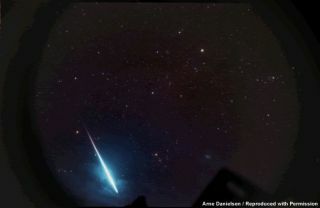 Along the Eastern Seaboard, the dawn sky was brightening, but where clear skies prevailed, viewers were able to see Leonids falling at rates of up to six per minute before it finally became too bright to see the stars. Farther west, where it still dark, Leonids were falling at a rate described by many as "too numerous to count." One observer stationed north of Mission, Texas said that meteors falling in all directions gave the impression of a "gigantic umbrella," appearing to "waterfall" out of the head of Leo. From Boulder, Colorado, the sky was mostly cloudy, yet in the clear patches as many as 10 Leonids per minute were visible. One astronomer took the initiative to get in his car and drive west on Colorado 119 up Boulder Canyon in a search for clearer skies. Upon his arrival at a dark sky site near Nederland at around 4:50 a.m. Mountain Time, he was " . . . stunned by the awesome display; I had the feeling that I should be hearing something. There were far too many meteors for any direct count." Perhaps the best views were from California and Arizona. At the Table Mountain Observatory, near Wrightwood, California, one resident astronomer commented that he and a colleague " . . . watched a rain of meteors, turn into a hail of meteors and finally a storm of meteors, too numerous to count by 3:50 a.m. Pacific Time. Instinctively we sought to shield our upturned faces from imagined celestial debris." From 6,850-foot Kitt Peak in southern Arizona, thirteen amateur astronomers started watching at 1:30 a.m. local time, counting 33 Leonids in their first hour. "This gave no indication," the leader of group later noted, "of the spectacle to come." During the second hour, the rate rose to 192. The meteors were now coming faster and faster and trying to make accurate counts was quickly becoming a fruitless task. Rates had climbed to about 30 per minute at 4:10, when a fireball about 30 times brighter than Venus suddenly exploded. By 4:30 several hundred Leonids were falling per minute and by 4:45, the observers were trying to guess how many could be seen by a sweep of their heads in one second. The consensus of the group was that the peak occurred at 4:54 when the staggering rate of 40 per second (144,000 per hour) was reached! Today, we know that a dusty trail of debris shed by Comet Tempel-Tuttle back in 1899 was what caused the Great 1966 Leonid Storm. That dusty material had made two revolutions around the Sun before colliding head-on with the Earth on that memorable night 40-years ago. Because such a trail of cosmic flotsam and jetsam is invisible until it enters in our atmosphere, astronomers were playing a game of blindman's buff not knowing exactly if or when we might encounter it. Today, with computer technology, it's a much different situation: Now, astronomers can readily locate the position of Leonid dust trails from the distant past or far into the future (here). But sadly, in the year 2028, Jupiter is expected to throw Comet Tempel-Tuttle off from its current path through space, making it all but impossible - at least through the beginning of the 22nd century - to see a repeat of the Great Leonid Storm of 1966. Specific details about the 2006 Leonids will be given in the Nov. 17 Night Sky Friday. Meantime, an overview is available here.